Kitty Doe is a likeable character, to say the least. Although Kitty can't read, she is incredibly clever, resourceful and she has a stellar memory. Her main goal in life up this point has been to pass the evaluation with at least a IV, then wait a month for her boyfriend, Benjy, to pass the test with a V or higher - Benjy is extremely bright and Kitty knows he won't get anything less than a V - and then they can live happily ever after together. Then the unthinkable happens: Kitty gets a III - meaning a life of poverty - and her work assignment is clear across the country in Denver, working in the sewers. Kitty feels she only has two options if she is to be able to stay with Benjy and avoid being transferred to Denver: run away or work in the clubs for a month, selling her body. She takes the latter option and gets prepared to sell herself to the highest bidder. Little did she know, the highest bid would come from the country's Prime Minister, Daxton Hart. He offers her the rank of VII, which is only reserved for the ruling family. With little time to decide, Kitty takes the deal. It is at this point that this story takes off like a freaking rocket. Gah! There is so much I could talk about! Like how I never knew who to trust, how the twists and turns that crop up everywhere practically plastered my jaw to the floor, how infuriating some situations were... THE ENDING! Gah! SO MUCH! But. But I want everyone to read this and I want you all to go into reading this just as blind as I was. Believe me, this pains me way more than it pains you, because I want to talk about everything that happens in this amazing book SO BAD! See? I'm even using ALL CAPS and lots of exclamation marks! 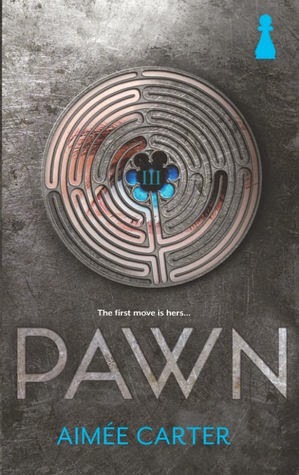 What I can say is, go read Pawn when it comes out on Tuesday (November 26). If you think you've read all there is to read in the dystopian genre, you haven't. This is so incredibly different and thrilling and twisted and terrifying and just flipping wonderful. I love it. I love it. I love it! Pawn has definitely cemented a place in my top reads for this year, that's for sure. The only bad thing about reading it a month or so early is that now I have to wait even longer until I find out what happens next! Book two, Captive, has definitely been added to my "must read" list for 2014. Gah! Buy this book, and when you've fallen in love with it like I have, come talk to me about it. So, so good.